To help you find out what you’re missing out on, WhooNEW complied a list of twelve artists that any indie music fan can appreciate. The first pick on the list is Mile of Music co-founder and Fox Valley native Cory Chisel. After all, without him this event wouldn’t be possible. Additionally, his band embodies the fest’s vision of “originality and creativity.” You’ll see that same theme repeated throughout this list. As soon as I heard Justin Townes Earle was playing Mile of Mile, I knew this festival was for real. The indie Americana singer-songwriter has learned some hard lessons in his young life and that’s reflected in his songs. Earle is dynamite talent that is easily at the top of my list of must-see acts. If you’re looking to see a band the moment before they strike it big, this is that time. PHOX is an energetic, immensely fun band from Madison, Wisconsin. The septet has played the area a bunch recently, and I would argue with anyone that PHOX is the next big band to hail from Wisconsin. This Brooklyn-based indie group is another one to keep your eyes on. Swear and Shake is a youthful promise of good things to come. The band’s album Maple Ridge is a delightful collection of folk pop rock. A number of Mile of Music performers are lighting up the Minneapolis music scene. Caroline Smith is one those artists. WhooNEW recently interviewed Smith about her upcoming Mile of Music performances. Smith told us this will give her a chance to showcase her new record which will be released this fall. If you like country music that isn’t polluted with pop, then Nikki Lane is your gal. Her music is Loretta Lynn mixed with heartbreak and rock ‘n roll. Lane has a commanding voice and a songbook that could save country music. Field Report is another band with Wisconsin roots. The band’s lead singer, Christopher Porterfield, originally played with Justin Vernon (Bon Iver) in Eau Claire’s DeYarmond Edison. Field Report’s self-titled debut album is a soft and sad collection of quiet and masterfully crafted songs. Communist Daughter is a band that up until now I hadn’t heard of. After listening to a few tracks from this St. Paul indie folk rock group, I knew I needed to include them on this list. The band’s songs recount the personal struggles of frontman Johnny Solomon. It’s heavy stuff at times, but a brilliant sound that I look forward to seeing at Mile of Music. Click here to learn more about this exciting booking. Switching gears from the folky Americana music that dominates this list is The Blakes. This Seattle trio is going to blow up Appleton with its lo-fi rock sound. Not only do The Blakes bring diversity to the Mile of Music lineup, they flat out rock. California Wives comes from south of the Wisconsin border. Their 2012 debut Art History draws from Alternative and New Wave influences. Their story is as good as their music. Check them out! Those Darlins is a rock group from Nashville. With country roots, this band gives Mile of Music a lot to scream and shout about. Those Darlins’ music is tongue-in-cheek and fun. I can’t wait to listen to their forthcoming album Blur The Line. As reported by Paste, their risqué album cover has already given Fox News a conniption. 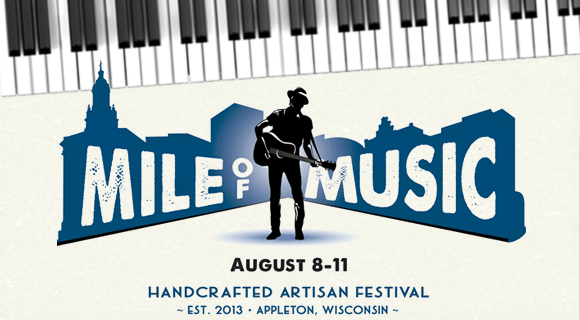 With more than 100 bands, Mile of Music promises to bring something special and exciting to the Fox Cities. If any of these performers caught your attention or if you’re looking to catch another band, you can see the full schedule by clicking here. WhooNEW would like to know which bands you’re excited to see. Please share in the comment section below. We look forward to seeing you at the first ever Mile of Music. That’s a great pick Laura. It was really really hard to narrow it down to 12.